Coldplay were kind enough to drop in for a chat with Marvin & Kat all about Beyoncé and their new music. We were lucky enough to grab Chris and Jonny for a quick chat this Sunday ALL about their incredible top ten single 'Adventure Of A Lifetime'. The dup told Marvin and Kat all about the upcoming new album, '[We were] actually recording for about a year, we made an album last year called 'Ghost Stories' which was a quiet thing however we knew that we wanted to write an album called 'A Head Full OF Dreams', so the concept was there for a couple of years'. 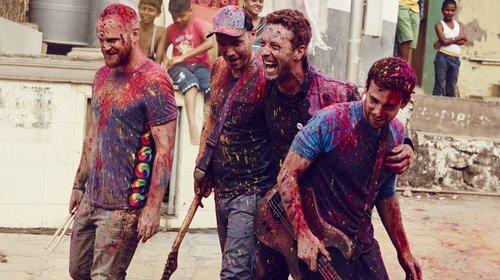 The LP which is due out on the 4th December 2015 was described by Chris Martin as 'the sound of a band just having fun'. He added, 'we took off all limitations and wrote what we though sounded fun'. The band have collaborations with Oasis legend Noel Gallagher and a whole host of others, 'We worked with Beyonce...she's the hugest of all names' also adding how the 7/11 singer was 'amazing'. Although it looks like even being Coldplay isn't enough to keep some nerves at bay. 'When Beyonce was coming in, it felt like the headmaster was about to show up', Chris added 'it brings a freshness and excitement to the day'.